Kitty Rambles A Lot: My first baby shower? So recently I went to my first baby shower. I'm not the most.... maternal of people, so Kirsty is actually the first person I've been friends with who has had a baby. A lot of my friends are like me, they don't want children, or they simply haven't had them quite yet. Rather than a typical baby shower, Kirsty had a pamper night. I thought this was a great idea, she's due in 2 weeks, so it was probably one of the last chances she will get to spoil herself for a little bit! For Kirsty's present, I opted to get her something, rather than the baby. I don't know much about babies or what they need, and she has a fantastic family around her, so I decided a cheeky 'baby survival kit' was in order. With baby wipes (cause babies are messy), relaxing bubble bath for the odd time she might get to chill out a little, tinted lip balm, so she can feel like she's made an effort even if she doesn't have time for proper makeup, and SO MUCH CHOCOLATE AND SWEETIES. Cause why not?! I am sure they will provide a much needed energy boost while chasing after her babies! When it came to picking an outfit, it needed to be comfy and cute. I was getting a manicure and a back massage, so being able to easily getting half naked without showing everyone my arse was a must! The cute tea dress is a lovely deep green colour, with a black lace area at the top, and the velvet leggings meant I could take off my dress but still be more covered up. 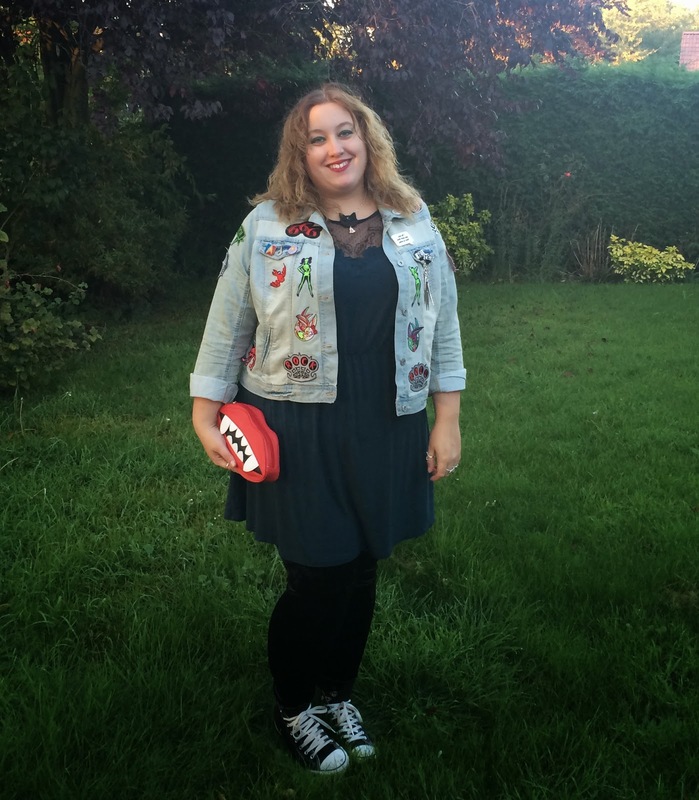 I went for casual with the denim jacket and converses, and finally got to use my new vampire clutch for the first time! A close up of my face and outfit details. I love this kitty necklace from Sugar & Vice, and the speech bubble you can see on my jacket is also by them, it features a True Romance quote :D My eye makeup is Sugarpill, and my lipstick is Barry M. I'm not skilled at makeup, but thankfully the bright colours help hide my lack of skill! You can actually see my smiley piercing here for once. How lovely is the lace detail on this dress? I've worn it a lot, and haven't done anything special when I washed it, and it hasn't snagged or pulled at all. Let's also ignore the lipstick on my teeth please. And my handbag. It easily fitted my wallet, phone, lipstick and my keys. And I have a lot of keys! I had a manicure and a back massage at the pamper night. Oh woooow the back massage. So having another one of those. I learnt that I am very tense in my shoulders and man did I ache the next day from the masseuse trying to work the knots out. Hi anxiety! I went for bright pink with a black ring finger for my nails. I'm going to doodle on the bright pink with my Barry M nail art pen I think! I also spent the evening fussing over Kirsty's adorable pooch, a staffy called Bruno who is missing one of his front legs. He is such a sweetie, and he looooves belly rubs, which is fine for me, I am happy to oblige! I'm trying to do a lot more outfit posts, so I hope you like them :) let me know what you'd like to see more of on my blog!